JERUSALEM — Of the 200 saplings Moni Shama planted in the Greek Orthodox Gardens on Jerusalem’s Mount Zion, seven remain. The rest were snapped at the stem, burned or otherwise destroyed, the caretaker said. Shama has also grappled with defacement of the gardens and verbal harassment and abuse that he and church officials blame on Jewish extremists. He said he’s cleaned up after vandals scrawled anti-Christian slogans on its gates, lit fires in the seminary and dumped old furniture and trash in an underground shrine on the site. “Sometimes they tell me I am an abomination,” Shama said. He is describing a hate crime often known as "price tag" attacks, in which Jewish extremists set fire to or desecrate property belonging to Palestinians or left wing Israelis. The name refers to the price the extremists seek to extract for the loss of each outpost. Experts and officials warn the practice is on the rise in Israel and the occupied West Bank, as hardline elements of Israeli society become increasingly emboldened. Shin Bet, the Israel Security Agency, has recorded 13 such incidents so far this year in the Israel West Bank — up from eight in all of 2017. Last year there were 105 indictments of Israeli officials versus 23 so far this year. The figures for the West Bank reflect a jump in hate crimes against Christian and Muslim Arabs across Israel in addition to the occupied territories, according to Nidal Othman, executive director of the Coalition Against Racism, which is based in Haifa and tracks such attacks. He estimated that there had been a twofold increase in attacks in the Palestinian territories over the last three years. On Monday, several cars were vandalized in a town near Ramallah in the West Bank — one of a spate of anti-Arab hate crimes this week. 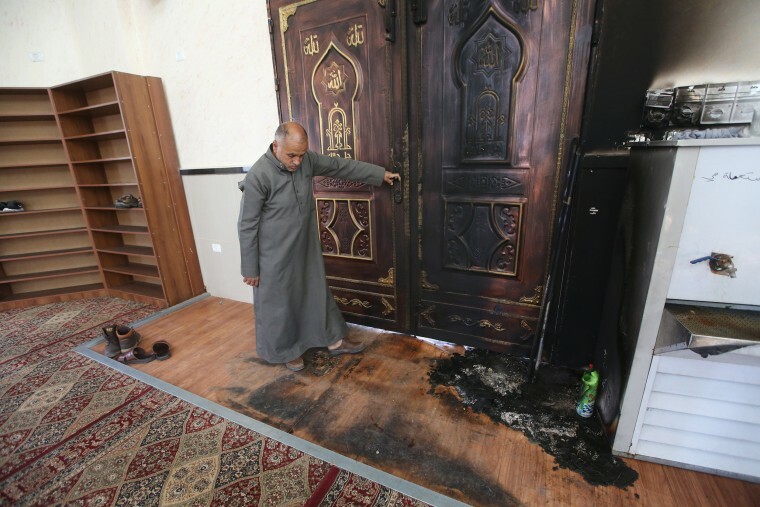 Earlier this month, Israeli police opened an investigation into an attempt to set fire to a mosque in the West Bank village of Aqraba. The mosque door was singed by flames and red graffiti on a nearby wall read "price tag." A police spokesman, Micky Rosenfeld, said the incident appeared to have had been carried out by radical Jewish groups with nationalistic motives. In March, three brothers from a settlement in the West Bank were sent to prison for attacking Palestinians and damaging property. According to the Haaretz newspaper, the court said the group "set out to terrorize and strike fear in the Palestinian population." And early on Wednesday, Akram Habshi, a farmer in Iksal, near Nazareth in northern Israel, and his family woke to find that two of their cars had been set on fire and the words “Jews will win” scrawled on a wall of their house. The graffiti was quickly scrubbed off the yellow stone, but Habshi said it has been harder to deal with the lingering impact the incident has had on his daughter. He said it was hard for him to understand how this had happened in his community, where Jews and Arabs had lived peacefully for years. While he said he did not know exactly who committed the crime, others blamed such attacks on Jews intent on driving Arabs off the land. “We all know that the police … do not take this stuff seriously,” Habshi said. While such attacks have been condemned across the political spectrum in Israel, Habshi is not alone in believing that Israeli officials are not doing enough. Paul Goldman, Lawahez Jabari and The Associated Press contributed.